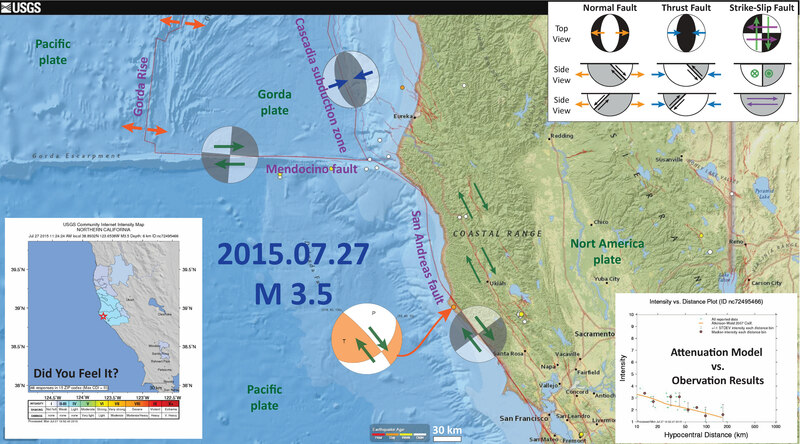 This morning there was another earthquake in northern CA between the San Andreas (SAF) and Maacama faults (MF). This region has been active for the past few years, with earthquakes in the M 3-4 range. 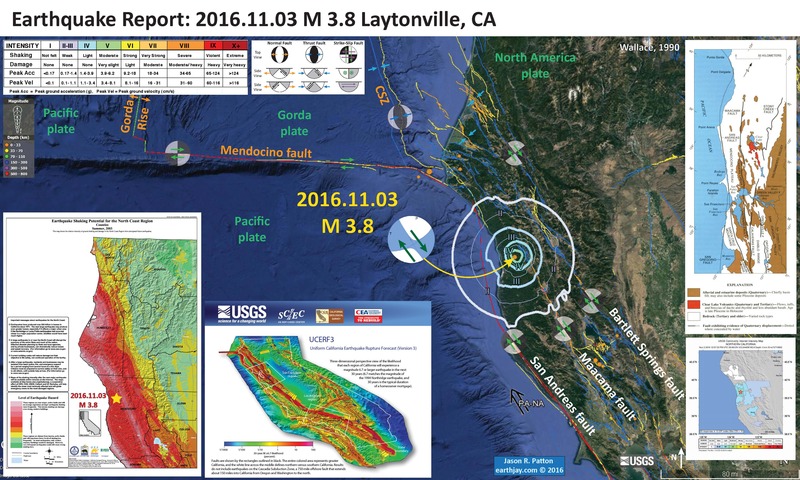 Most recently, there was a M 3.8 really close to today’s M 4.1. These earthquakes may indicate the possibility of an unmapped fault. There have been earthquakes in 2000, 2014, and 2015 that align along strike (of a possible fault that is sub-parallel to the SAF/MF systems). 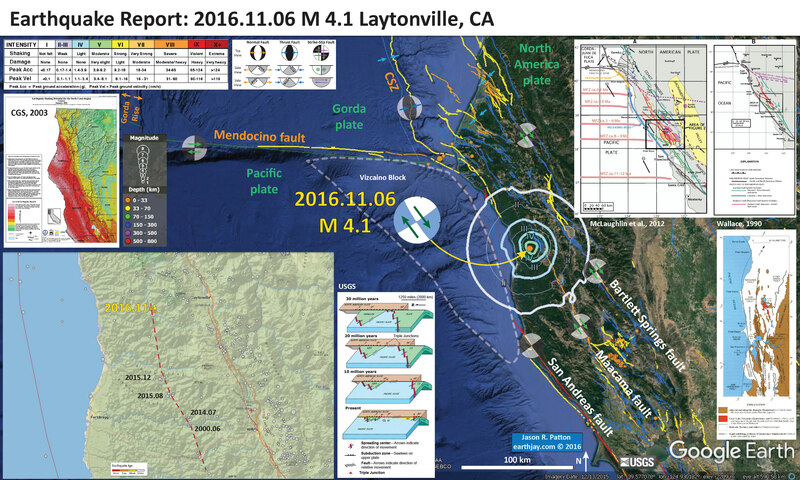 Here is the USGS website for today’s M 4.1 earthquake. Below I plot the seismicity from the past month, with color representing depth and diameter representing magnitude (see legend). I use the USGS Quaternary fault and fold database for the faults. I outlined the Vizcaino Block, which many interpret to be a prehistoric subduction zone accretionary prism from a time before the San Andreas existed. In the upper right corner I include a map from McLaughlin et al. (2012) that shows the regional faulting. In the lower right corner I include generalized fault map of northern California from Wallace (1990). In the lower left corner I include a map that shows the seismicity for this region since 1960, including earthquakes with magnitudes greater than or equal to M 1.5. I have labeled some of the significant earthquake swarms, with magnitudes ranging from M 3-4. Here is the USGS search that I used to create this map. To the right of the seismicity map is a figure that shows the evolution of the San Andreas fault system since 30 million years ago (Ma). This is a figure from the USGS here. In the upper left corner I include the Earthquake Shaking Potential map from the state of California. This is a probabilistic seismic hazard map, basically a map that shows the likelihood that there will be shaking of a given amount over a period of time. 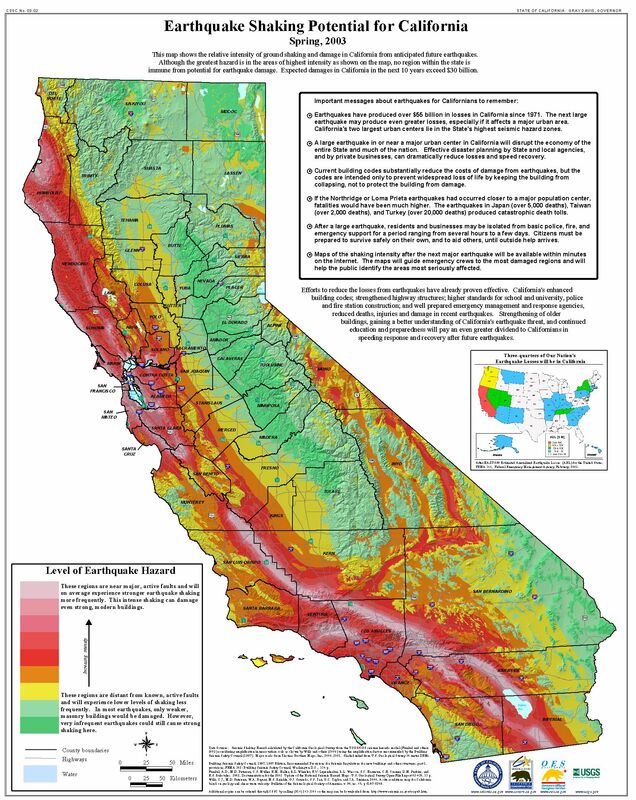 More can be found from the California Geological Survey here. I place a yellow star in the approximate location of today’s earthquake. Earlier this month (a couple days ago), there was an earthquake in this region. Below is my interpretive poster for that earthquake. Here is my Earthquake Report. Earlier this year, there was an earthquake in this region, along the BSF. Below is my interpretive poster for that earthquake. Here is my Earthquake Report. Last year there was an earthquake in this region. Below is my interpretive poster for that earthquake. Here is my Earthquake Report. 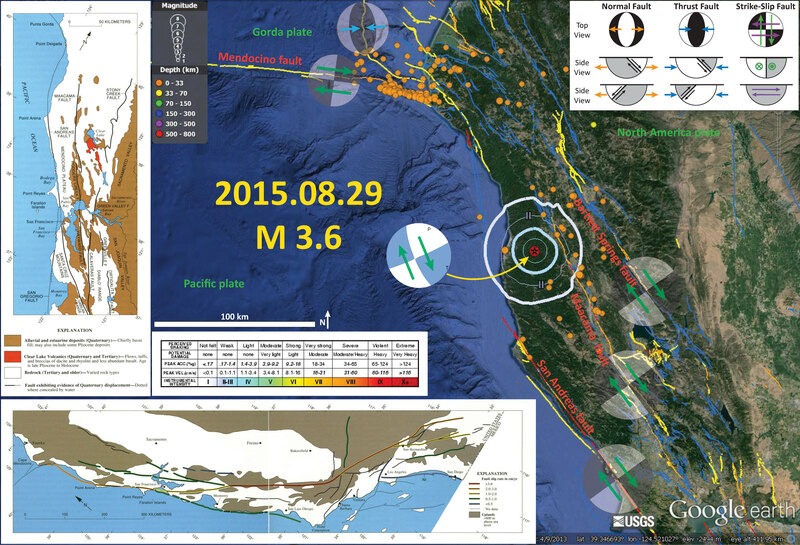 There was a recent earthquake along the San Andreas fault in the Point Arena region in July of 2015. 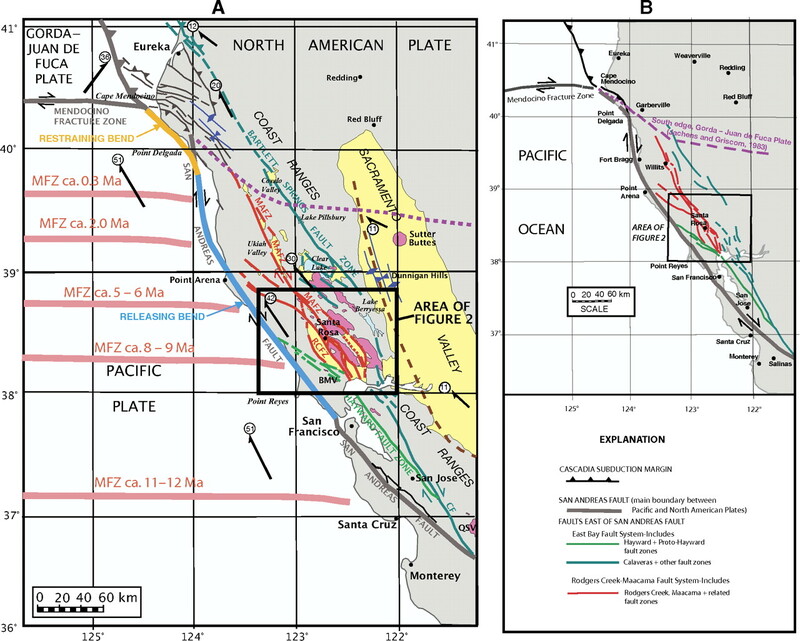 About 75% of the relative plate motion is accommodated along the SAF and its synthetic sister faults in the northern CA region. 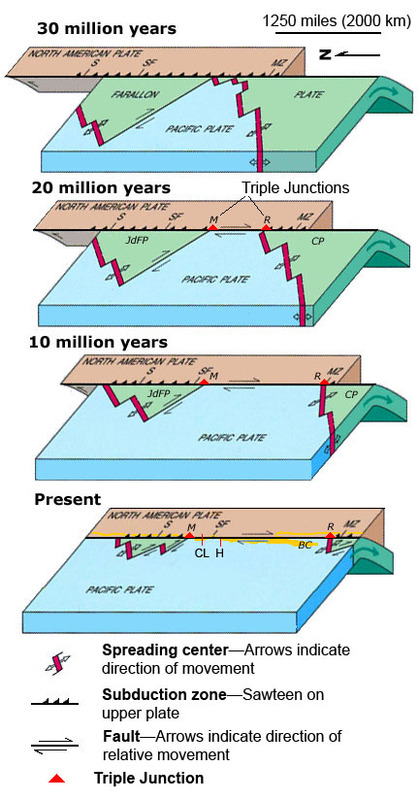 The rest of the plate boundary motion is accommodated along the Eastern CA shear zone and Walker Lane, along with the Central Nevada Seismic Belt, and the Wasatch fault systems. 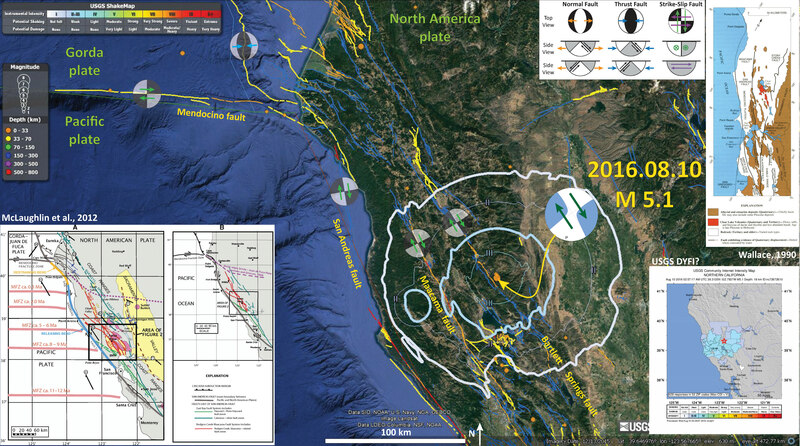 In Northern CA, there is about 33-37 mm/yr strain accumulated on the SAF plate boundary system. About 18-25 mm/yr is on the SAF, 8-11 mm/yr on the MF, and 5-7 mm/yr on the Bartlett Springs fault system (Geist and Andrews, 2000). 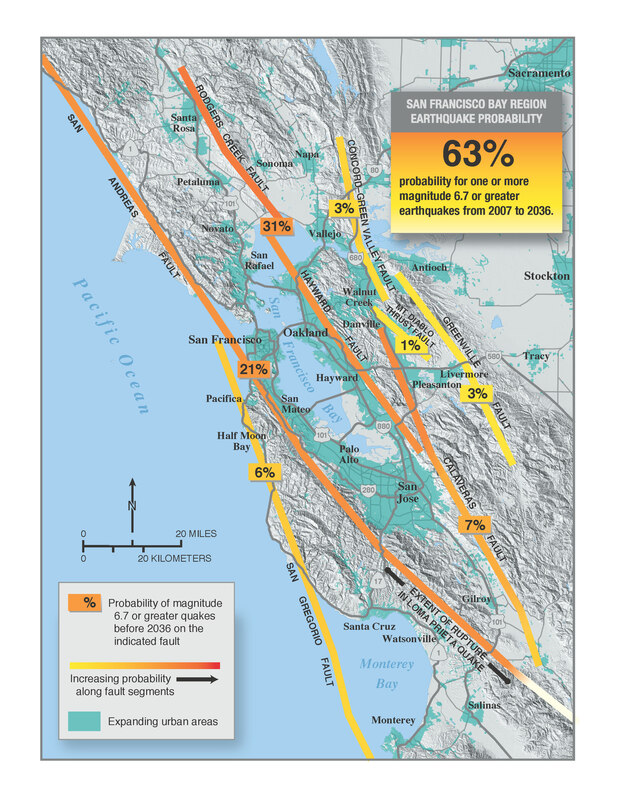 This is a map that shows the probability of earthquakes along these fault systems in the San Francisco Bay region.